Celebrate Labor Day with this airy and luscious dessert. Slabs of frozen whipped cream folded with crumbled meringues are served with a compote of the season’s freshest berries. It doesn’t get easier or lighter that this, a perfect last hurrah to summertime. Prepare the cream at least 8 hours before serving and eat within one day – which shouldn’t be difficult. Feel free to mix up the berries to your taste. Serves 8. Lightly oil a 9 x 5-inch loaf pan. Line with plastic wrap, leaving a 3-inch overhang on all sides. Crumble 1/3 of the meringues, leaving large chunks intact, and spread over the bottom of the pan. Beat the cream in the bowl of an electric mixer fitted with a whisk attachment until traces of the whisk appear. Add the sugar and vanilla and continue to beat until soft peaks form. Crumble the remaining meringues and gently fold into the cream. Pour into the pan and spread the cream evenly on top. Cover with the plastic overhang, then cover the pan entirely with another piece of plastic wrap. Freeze for at least 8 hours and up to 24 hours. Prepare the compote: Combine the berries, sugar and lemon juice in a medium saucepan over medium-low heat. Cook until the sugar dissolves and the berries break down and release their juices, stirring frequently. Remove from heat and cool completely. To serve, remove the frozen meringue cream from the freezer. Unwrap the plastic and invert the cream onto a serving platter. Remove remaining plastic. Cut into serving slices and serve with the compote. Divine! That’s the kind of fruity dessert I love to eat. A perfect end to summer! Just what we all need! easy and scrumptious never looked better! Have a tasty holiday weekend! Great dessert to end summer with! And it’s always perfect when it’s somethin that can easily be thrown together when you don’t want to spend all day in the kitchen. Gorgeous photo! 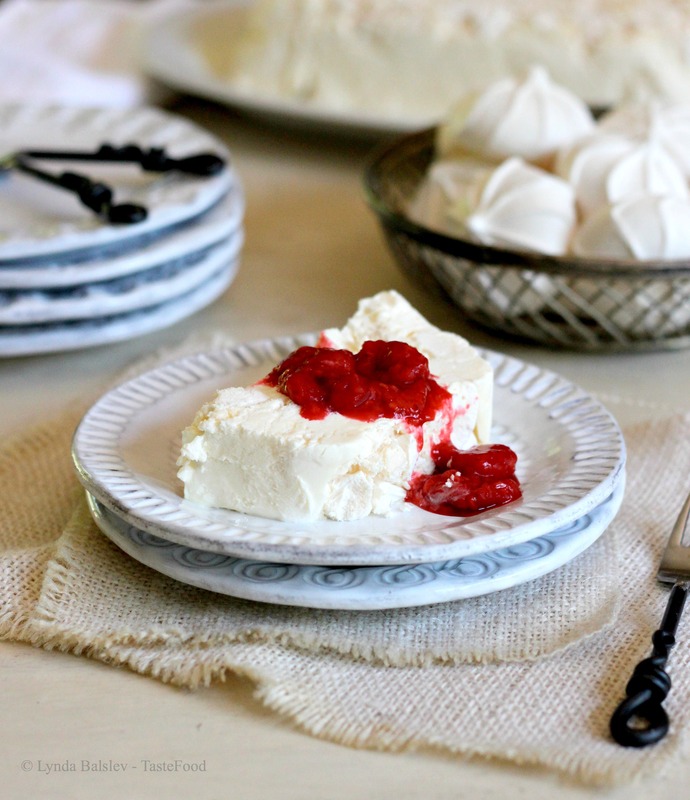 I love meringues and cream and agree this is a great way to end the summer! What a beautiful dessert – and so, so easy to make. Love this for any time of year! I don’t think I’ve ever heard of this frozen cream – meringue component….brilliant!